"Solange Michel presents a Carmen of the old school. 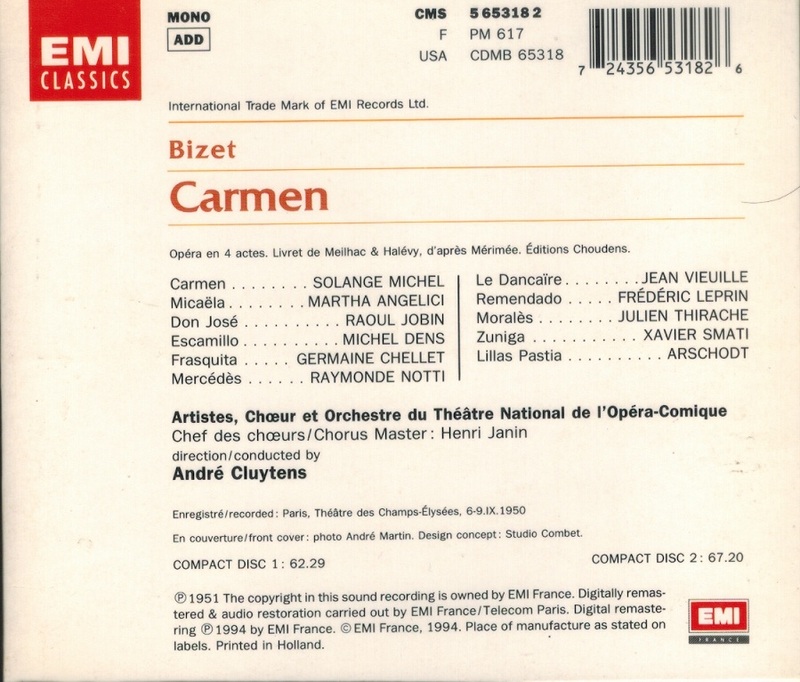 Her voice is really more contralto in quality and her diction suggests not so much a sensual gipsy as an actress at the Comedie-Française. Nevertheless, there is something fascinating and endearing about her portrayal. 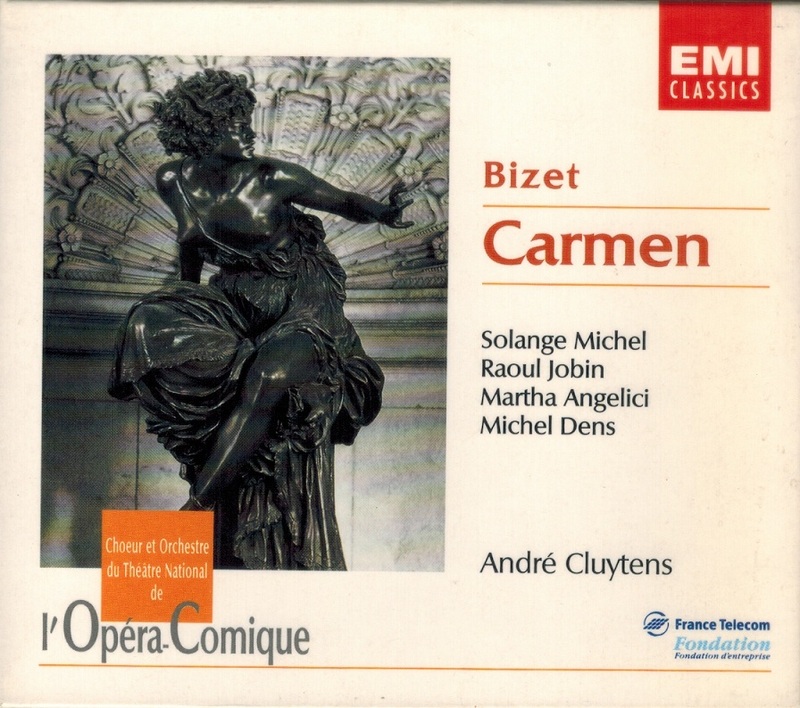 One simply could not find anyone today who sounds like her – and yet she was the favourite Carmen at the Opéra-Comique, where she sang the role at the 2,500th performance there and went on to notch up 500 of her own! Michel Dens is a swaggering Escamillo and Martha Angelici a convincing Micaëla. 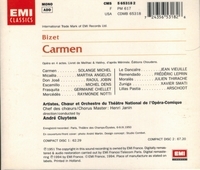 Of course, with such heavy competition where CARMEN on CD is concerned, this set is valuable principally as a document of the opera's performing tradition." “Raoul Jobin, the leading French Canadian tenor of the 1930s and 1940s, studied in his native Québec and then at the Paris Conservatoire, making both his concert and Paris Opéra débuts in 1930. After a spell back in Canada, he returned to the Opéra in 1934 and was a valued member of the company thereafter. He made his Covent Garden début in 1937 and from 1940 to 1950 was regularly engaged at the Metropolitan in New York, also singing with other companies in North and South America. He sang at the Opéra-Comique from 1946. Although he was best known in the French repertoire, Jobin also appeared with success in Italian rôles and the lighter Wagnerian parts. He taught singing in Montréal from 1957 and made his final stage appearance the following year. His exciting voice can be heard on many recordings.